Just finished the second Haunted Holtzville House. I’m making a neighborhood of houses based on the Tim Holtz village series for this Halloween. Obviously, Haunted Holtzville is named in honor of Tim. This is the second house. It does not have a name, but the family that inhabits this house has 2 children so they needed the dormers upstairs to give the children a little more room. The parents chose this house for the affordability, the color pattern on the outside and the fact that there are 2 bedrooms upstairs. The rooms are small, but the children don’t really need big rooms, do they? That’s the backstory on this house. This house was constructed using the Village dwelling die along with some embellishments from the Village cottage die. I also used the roof die for the shingles. It’s hard to see on the front, but there are a series of steps cut into the base to enter the house. 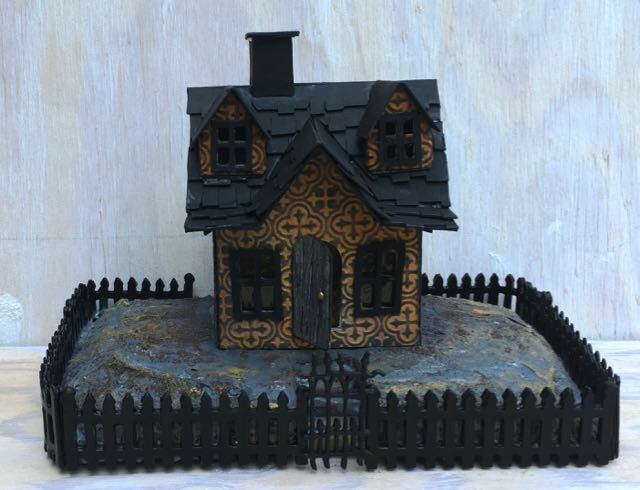 The gate is made from one of the new Tim Holtz Halloween dies – the Village Graveyard. I didn’t use the actual gate die because it was too big and formal looking for this modest home. 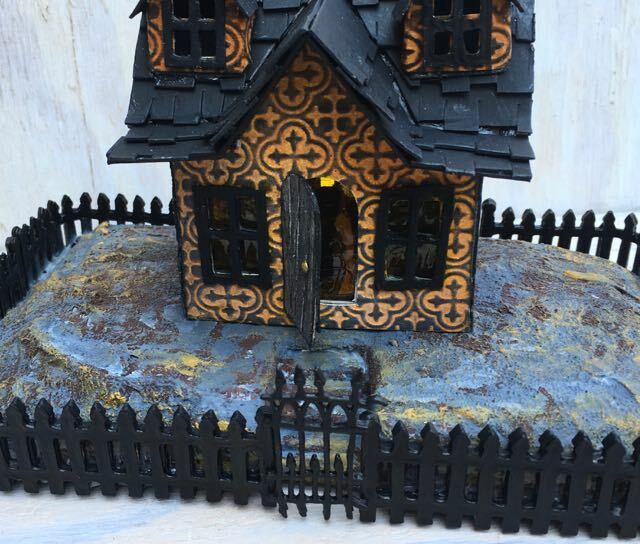 The fence is made from 3 layers of cardboard cut from the Village Cottage die. 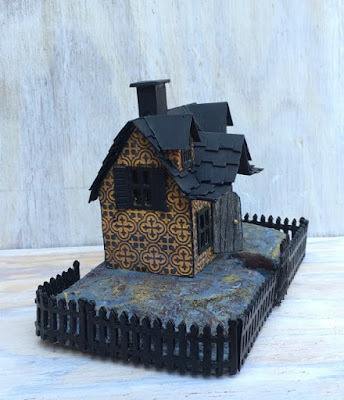 The texture on the surface is made from a Tim Holtz texture fade – tiles stained with Wild Honey stain and highlighted with black soot on the raised embossed surface. I made the base my usual way – layers of corrugated cardboard glued together, covered with paper mache and painted with layers of paint. There is a space cut out for an LED light. Landscaping is not complete on this house yet. I haven’t decided what Halloween embellishments to add to the exterior at this point. So I said it was finished, but there is a little more decorating to do. Side View of Haunted Holtzville #2. You can see the stairs a little better in the view below. Back view of Haunted Holtzville #2. I haven’t decided if I am going to extend the fencing all the way around. I may just make one more sturdy fence and cut it in half so the fencing looks complete from the front at least. Oh, look! You can barely see the shadow of one of the inhabitants in the doorway below. The family is very shy, you hardly ever catch a glimpse of them. I think they are allergic to daylight. That’s the second house for Holtzville. More to come. 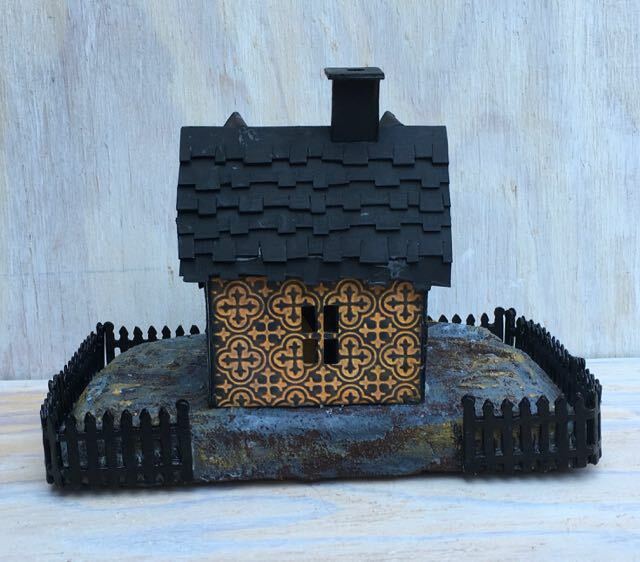 I really like the shingles! This house needs a spooky tree! Yes, it does need a tree. I will have to make a wire and paper mache tree to fit the house. This is a nice one Lucy. I love the dormers – and what a fun backstory! 😉 Your bases are always amazing and this one is no exception. The fence fits the house so well. I love the way you make fences that go around the edge of the base.